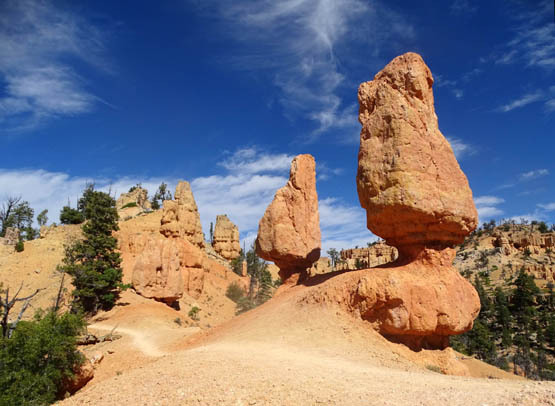 hoodoos are abundant along the trail with some narrow ridgelines." 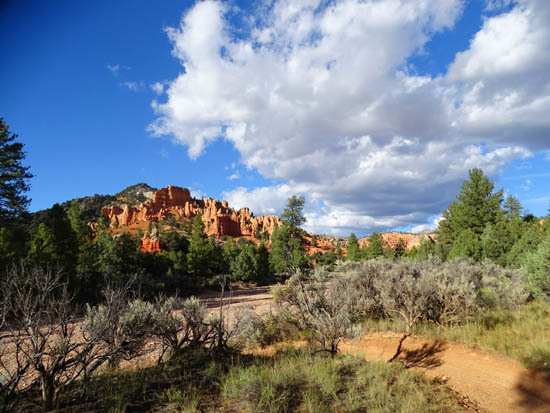 I've used a lot of superlatives to describe about a dozen of the other trails in Red Canyon that I've hiked. How can it get any better, you ask? I saved my favorite trail for last, so expect even more superlatives and lots of photos! 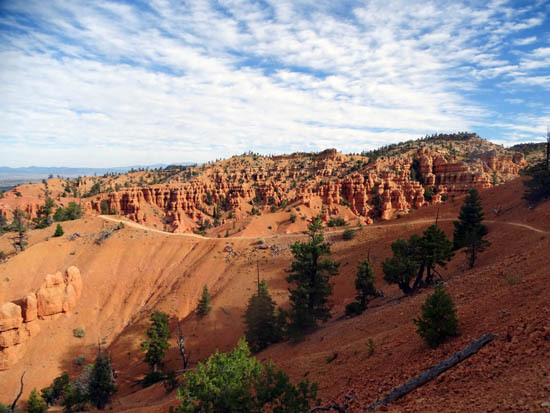 I've already written some about this trail in an entry about the different places Jim and/or I rode our bikes in the Red Canyon-Bryce Canyon area. Folks interested only in hiking may have skipped that entry since it focused on cycling. 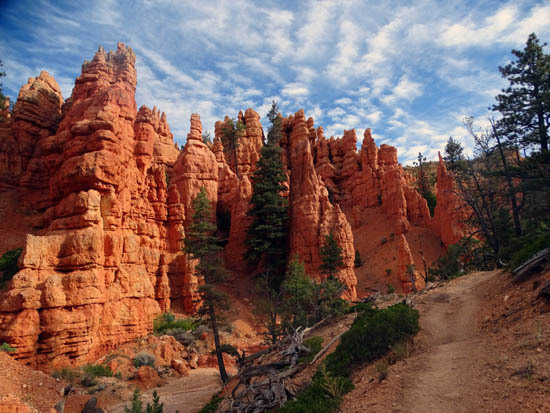 This entry will be more specific to hiking this spectacular trail. I'll include lots more photos of the scenery, including a virtual tour from the low end to the high end -- the opposite way most cyclists ride it. 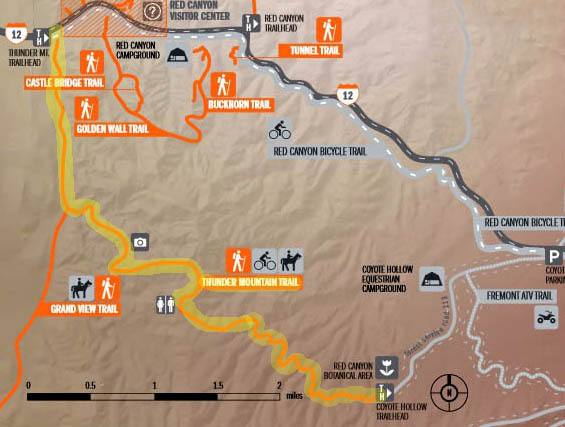 Hikers should note that this is a multi-use trail for hikers/runners, cyclists, and equestrians. It is a real favorite of mountain bikers who crave a challenge. 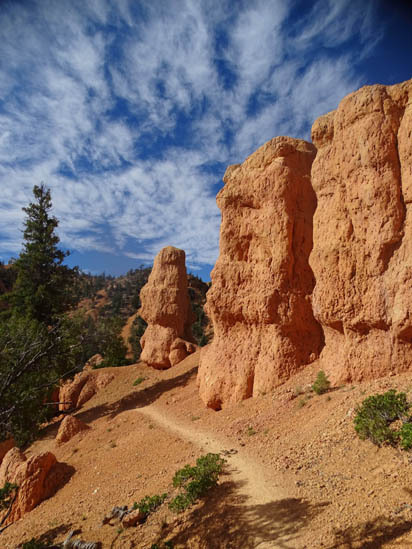 After you hike it you'll understand why cyclists consider it a badge of honor to have ridden it successfully. I can't imagine riding a bike on some parts of this trail! I'm a little paranoid when I'm hiking the trail because of the cyclists. 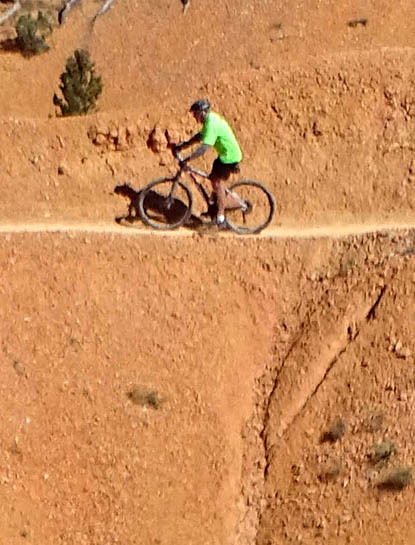 There are lots of blind curves you -- and they -- can't see around, some very narrow trails with steep drop-offs on one or both sides where there is no place to step out of their way, and a few places where cyclists can really fly. Most of them are courteous but a few are obviously annoyed when they have to slow down for other trail users. 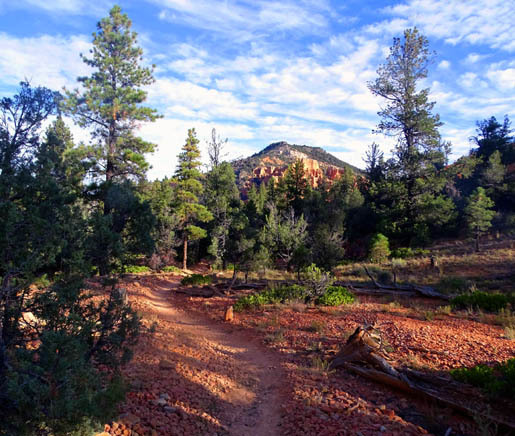 Just be cautious when you're hiking because there are usually more cyclists on this trail than hikers or runners. but he doesn't plan to go back and ever ride this trail again! The trail is also open to equestrians. They are not a problem for hikers and runners. In six decades of hiking I've never encountered a careless or discourteous horseback rider on any trail, anywhere. Just watch where you step . . . And if you're hiking with a dog, watch that they don't eat too much horse poop. Our Labs love the stuff. I mentioned in the last entry that I wanted to hike this trail our first full day in the area but a ranger at the visitor center discouraged it. He said bikes and horses had messed up the trail after a rain. He referred me to the Cassidy-Rich trail system as an alternative for a relatively long hike instead. I didn't know any better so I waited a couple weeks before hiking Thunder Mountain. But I want to hike this trail! I heard later that the rangers discourage all hikers to avoid this trail because of all the mountain bikers. Some cyclists simply don't like sharing the trail with pedestrians because it slows them down. I don't know if the rangers are trying to protect hikers or caving in to the cycling community. Maybe both. 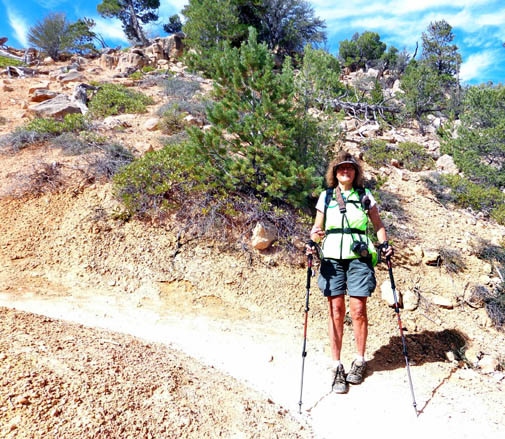 I do know that after three long visits in the area and multiple hikes on the trail when it's both wet and dry, it is almost all rock and sand and it dries out very fast. Too fast, in fact. It's easier to hike when it's wet or damp because the loose rocks aren't as much like ball bearings. In my experience, tire tracks and horse divots aren't much of a problem for hikers. I've also been able to easily bypass any short-lived mud or puddles on rocks next to the trail. 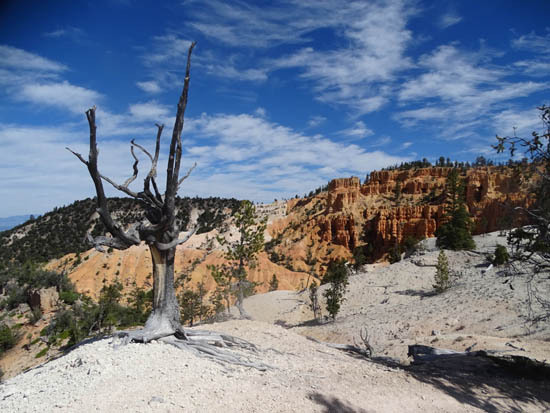 So don't let a ranger discourage you from hiking this trail. Pedestrians and horses have the right of way and cyclists are supposed to yield to both, whether they like it or not. 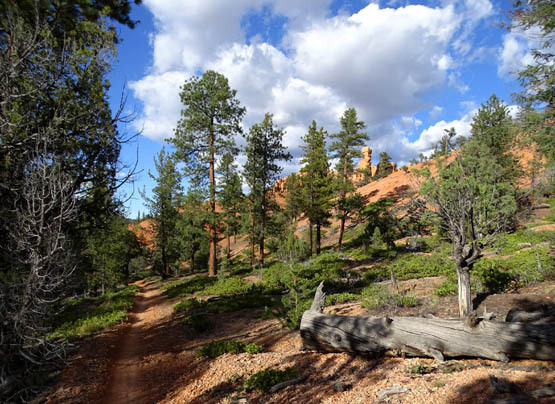 It's an easy-peasy ride (or hike) at the lower end of the Thunder Mountain Trail. 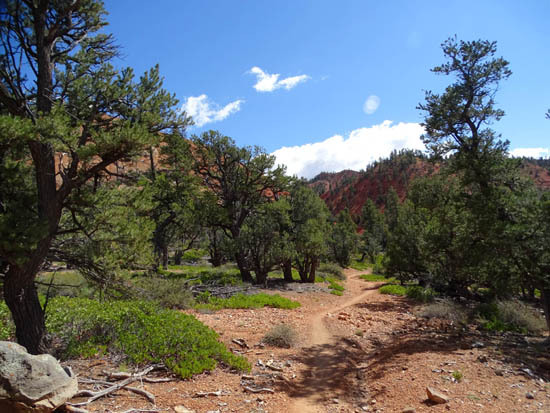 Just be careful when hiking, especially at the lower end where the trail is more smooth and straight for over a mile along a wash. Cyclists are so relieved to be done with the difficult parts of the trail that they want to bomb down the last 1+ mile to the lower trailhead. It's there that the most danger lies from a speeding bike. It's also there that the most hikers are likely to be walking. 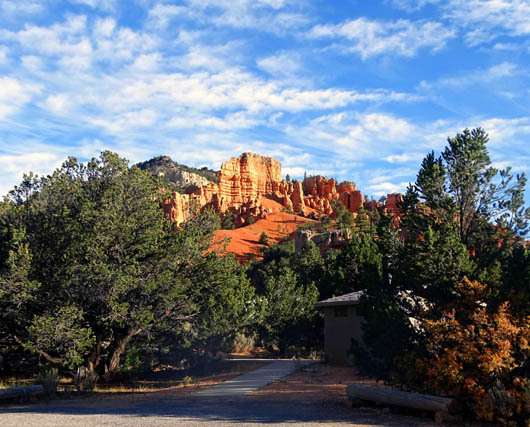 It's the first trailhead visitors see as they come into Red Canyon, the trailhead is close to the road, the trail starts off easy at that end, and there is plenty of parking. 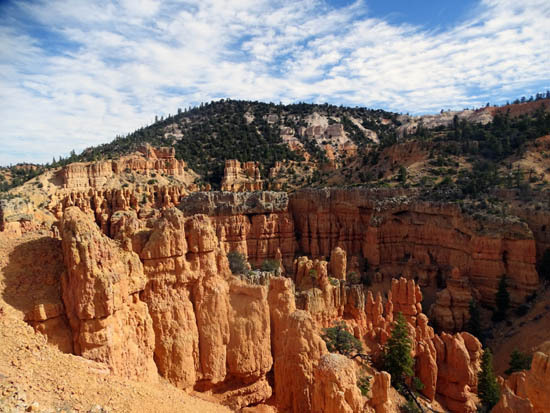 Many of the hikers new to the area have no clue about the risks. OK, I'll get off my soapbox. I'm not anti-cyclist. I like to ride my bike on trails, too. I've just had too many negative experiences in my lifetime, while running and hiking, with careless mountain bikers. When I encounter the courteous ones, I thank them with sincerity. The Thunder Mountain Trail runs point-to-point for about 8 miles as marked in yellow below. There are ways to make it longer or shorter that I'll mention later. Thunder Mountain has two trailheads. The elevation at this upper trailhead is about 8,050 feet. Since the trail has a net downhill from this trailhead it's where most of the cyclists start their rides. A few hardy -- or clueless -- souls start from the low end and have to ride up a bunch of gnarly switchbacks but they're a distinct minority. As you can see, the high point is approximately halfway between the lower and upper ends of the trail. Near the "White Point" sign on the trail the elevation tops out at about 8,250 feet. I hiked this trail twice during our Fall 2015 visit. The photos in this entry are from both of these hikes. On my first hike Jim and I parked a vehicle at either end of the trail. 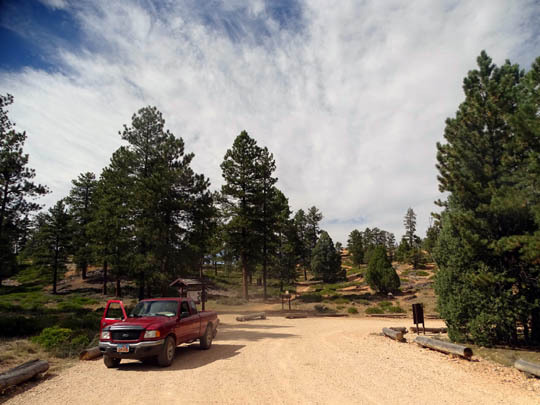 I drove our truck to the lower trailhead and hiked up the trail (eastbound) to Coyote Hollow. It's easier for me to hike uphill and that way I could also see any cyclists coming at me, since most of them go downhill (westbound). I had a total of 8.75 miles (including half a mile on the spur trail to Inspiration Point), 2,165 feet of elevation gain, and 1,101 feet of loss in that point-to-point hike. and I took the photo of him below. Jim drove the car to the upper trailhead so I'd have it when I got done hiking. 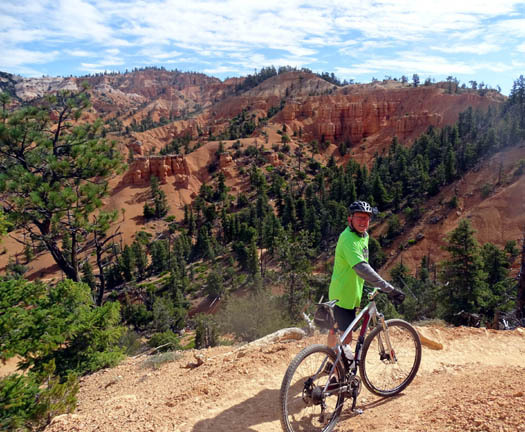 He took his bike so he could ride back to the campground on Coyote Hollow Road and the bike path down through Red Canyon. That day about 30 equestrians started up the trail before me from the lower end. I never saw them but Jim passed them on his way down the trail on his bike. I saw a total of six cyclists that day, including Jim -- and no one else in four hours. It was a warm, mostly sunny Thursday. The next time I hiked the trail was six days later, another warm, mostly sunny weekday. Since the best canyon views and the most interesting rock formations are in the lower four miles of the trail, I hiked up from the lower end of the trail to the twin hoodoos next to the trail right at four miles (shown below, a few hundred feet past White Point going eastbound), then turned around and went back down. I included the Inspiration Point spur trail again that time, giving me a total of 8.51 miles and a total elevation gain and loss of 3,553 feet. That day I saw 11 cyclists, all going the downhill direction -- and no one else. I mentioned that there are ways to vary the distance hiking this trail. The easiest way is to start at either trailhead and go out and back for whatever distance you want, giving you anywhere from a mile to 16 or 17 miles total. That way you don't have to spot two vehicles or have someone drop you off or pick you up. I like to do that from the low end so I can see the spectacular canyon views. 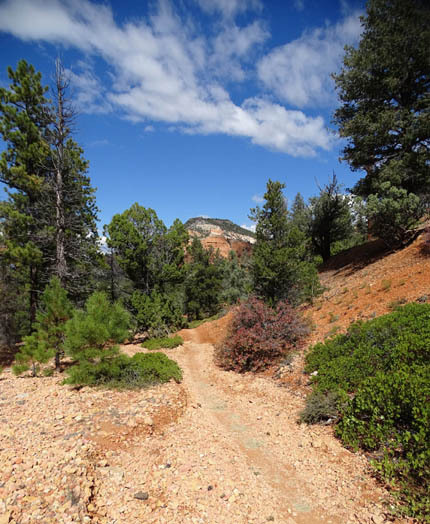 Another way is to do the Inspiration Trail, a spur trail about 2� miles from the lower end of the Thunder Mountain Trail. It has good views of the upper amphitheater if you go all the way to the overlook at the end of the spur. Out and back adds half a mile to the total distance. I did the Inspiration Trail on both hikes this fall. 2) do the 15-mile loop that many cyclists ride that includes dirt Coyote Hollow Rd. 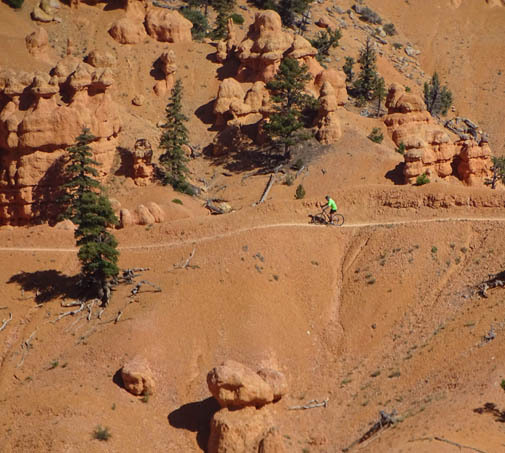 and the paved Red Canyon bike path. On two hikes I took hundreds of photos of this trail. Jim also took a few. I've edited them down to 488 pictures -- still quite a large number. I'll have to be very selective re: which ones I show in this multi-page entry. I hope you enjoy them! 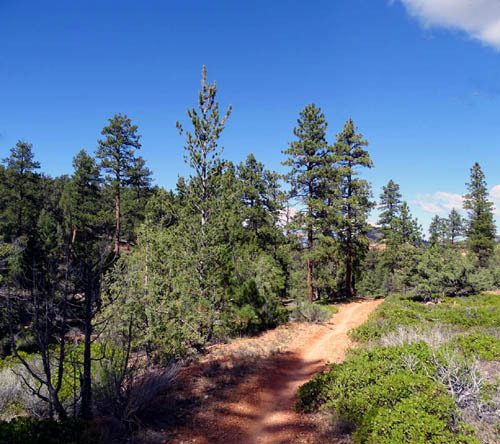 Photos in this virtual tour are arranged from the low end to the high end of the trail and show views in both directions. 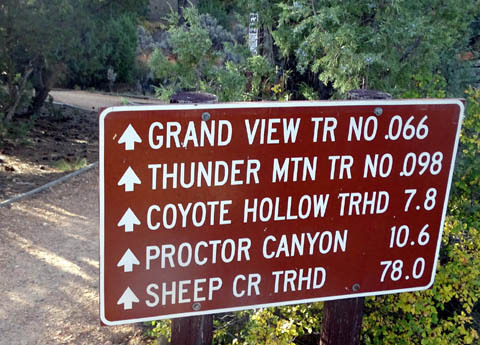 At 1.5 miles the Grandview Trail continues straight (south) and the Thunder Mountain Trail goes left (east) toward Red Rock Canyon. Virtual tour continued on the next page.